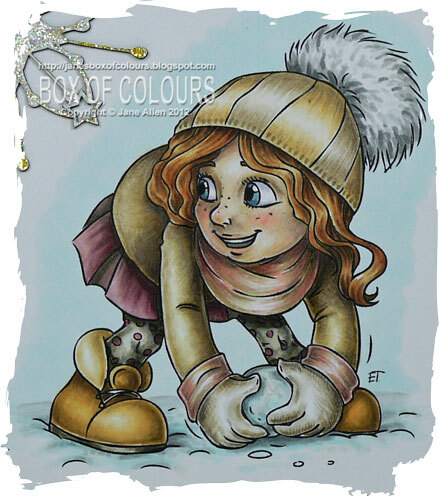 Jane's Box of Colours: Game of snowballs anyone??? Awesome awesome coloring! I am so subscirbing and following your blog ! Just absolutely amazing! Tell me why you aren't illustrating? Wowowowowowowonderful colouring, I love it... no, I adore it!! I pay tribute to your mastery of the pencils!!! This is gorgeous Jane. I love the image and you've coloured her beautifully. I love the depth you've achieved...stunning! OMG Jane can your colouring get any better! This is amazing? I wish I could get my highlights to look like this. Amazing coloring Jane! Hugs! Your work as always is incredible. Thanks for sharing. If I need ideas for colour's I know exactly where to look. I love the colour's you pick up from the backing papers. Fantastic colour for a Christmas card. Lovely image and beautiful coloured. Just gorgeous Jane! Fab card and stunning colouring. Beautiful Jane, she really pops off the page. Jane, your colouring is always outstanding! Love this!! Woo Hoo I made it, I'm in my lunch hour but I got here, yayyyy. OMG Jane, you certainly bring these characters to life. Perhpas you should be writing a book!